Long and curled eyelashes are the jewelry of a pair of beautiful eyes. They not only add drama to the eyes but also help in making the mascara look amazing. But very few of us are blessed with long and naturally curled eyelashes. Hence, when we need to achieve an attention-drawing eye makeup look, artificial eyelash curlers act as our rescuers. Today, I’ll be reviewing the Faces Canada Eyelash Curler, which has been gaining a lot of popularity these days in the Indian market. Read on to know more about it. The name itself speaks about it, isn’t it? Well, an eyelash curler is a mechanical device (precisely, a beauty tool), which is used for curling our natural eyelashes. It is a metal-made and manually-operated tool that is mostly used for cosmetic purposes. An eyelash curler usually comes with rubber pads to make the contact between the lashes and the device gentle, smooth, and easy. Though the general design of an eyelash curler has remained intact since its first launch, the device itself has gone through a lot of enhancements. Now, you can get two different types of eyelash curlers. The first one is obviously the traditional eyelash curler like the one I’m going to review in this post. It is designed to match the natural shapes of our eyes while the rubber pad in it is pressed against the lashes for creating curls. The traditional eyelash curlers are cheap and easy to use. The second one is the heated eyelash curler that delivers intense, long-lasting curls for your lashes. Needless to say, it is a pricy version of the tool. The Faces Canada Eyelash Curler is ideal for curling up your eyelashes the way you like. It comes with an ergonomic design and a contoured grip to make it easy for you to get curved and beautiful eyelashes. It creates curls that last for a whole day and no mascara is needed to hold them. The eyelash curler is easy to use for beginners too. Wipe the rubber pad clean and use it before applying your mascara. Open the eyelash curler and center your upper eyelashes between the rubber pad and the curved plate. Squeeze the curler for about 20 seconds and open handles to release the lashes. Repeat the procedure if added curl is required. For best results, wipe the rubber pad clean after each use. 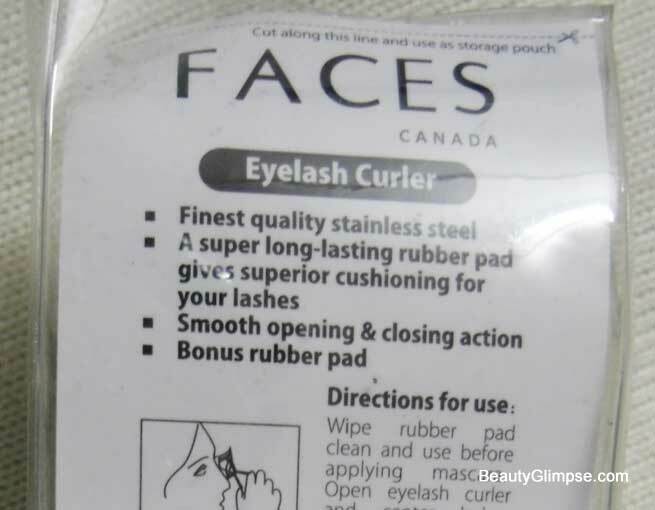 Faces Canada Eyelash Curler comes in a simple plastic pouch along with some extra padding and a transparent plastic safety clasp. The pouch makes it portable and easy to carry while the small and compact design of the tool makes it travel-friendly as well. An instruction manual is also provided with the pouch, which lists the directions of use, the ways to open up and close the curler and how to make optimal use of the rubber pad. Well-defined eyelashes make a huge difference and that is why I wanted to try an eyelash curler. This is my first ever eyelash curler and hence, I did not want to invest in high-end brands. As I thought of trying a cheaper one, this Faces Canada Eyelash Curler caught my attention. It looks pretty and affordable so I thought of giving it a try. 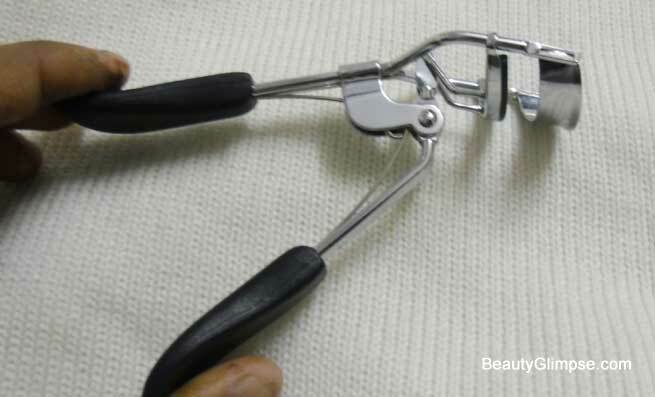 The eyelash curler is made of sturdy stainless steel. It has cute black handles that look like scissors. The cushioned handles are good for grip and they help in applying the right amount of pressure during the use of the tool. There is also a plastic coating, which makes it easy to handle the curler. A soft rubber pad is attached to the top of the curler which curls lashes gently without being harsh to them. An additional rubber pad is also provided, which is a bonus. However, you must make sure to clean the rubber pad before using in order to avoid hygienic issues. This curler, indeed, does a good job. It curls my lashes and opens up my eyes. After applying mascara my eyelashes remain curled for around 4 hours, which is pretty good. Overall, I am very happy with the results. However, you must clean the padded area after every use to be on the safer side. How Do I Use The Eyelash Curler? Hold the eyelash curler and make a tight grip as you are going to use it near the delicate areas of your eyes. Now, place your lashes between the rubber pad and the curved plate keep it pressed for around 10 seconds. Apply a little pressure only so that your lashes curl up but don’t be too harsh. And also, don’t keep the eyelash curler pressed for too long as it can damage your lashes. Faces Canada Eyelash Curler curls lashes in 10 seconds and the effects stay for long. It has a cushioned grip for easy handling and a rubber pad attached to the top for gentle application. Price of the product is decent and it comes with an additional rubber grip too. I would recommend it to everyone.